This page provides references and links to publications on Chersobius and Homopus species. The first section refers to publications that were generated by, or with, Dwarf Tortoise Conservation (reprints are available), whereas the second section provides a general (incomplete) bibliography on Chersobius and Homopus species. Hofmeyr, M.D., Henen, B.T. and Loehr, V.J.T. 2005. Overcoming environmental and morphological constraints: egg size and pelvic kinesis in the smallest tortoise, Homopus signatus. Canadian Journal of Zoology 83: 1343-1352. Loehr, V.J.T. 1999. Husbandry, behavior and captive breeding of the Namaqualand speckled padloper (Homopus s. signatus). Chelonian Conservation and Biology 3: 468-473. Loehr, V.J.T. 2002. Diet of the Namaqualand speckled padloper, Homopus signatus signatus, in early spring. 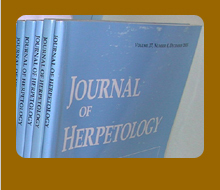 African Journal of Herpetology 51: 47-55. Loehr, V.J.T. 2002. Population characteristics and activity patterns of the Namaqualand speckled padloper (Homopus signatus signatus) in the early spring. Journal of Herpetology 36: 378-389. Loehr, V.J.T. 2004. Growth of the Namaqualand speckled padloper, Homopus signatus signatus (Reptilia: Testudinidae). African Zoology 39: 309-313. Loehr, V.J.T. 2006. Natural diet of the Namaqualand speckled padloper (Homopus signatus signatus). Chelonian Conservation and Biology 5: 149-152. Loehr, V.J.T. 2006. Egg and hatchling characteristics of the Namaqualand speckled padloper (Homopus signatus signatus): preliminary data from a captive population. Chelonii 4: 273-276. Loehr, V.J.T. 2008. The ecology of the world's smallest tortoise, Homopus signatus signatus: effects of rainfall. PhD dissertation. University of the Western Cape, South Africa. Loehr, V.J.T. 2010. Structure and dynamics of a Namaqualand speckled tortoise (Homopus signatus signatus) population over 5 years of rainfall variation. Chelonian Conservation and Biology 9: 223-230. Loehr, V.J.T. 2012. High body temperatures in an arid, winter-rainfall environment: thermal biology of the smallest tortoise. Journal of Arid Environments 82: 123-129. Loehr, V.J.T. 2012. Road mortality in the greater padloper, Homopus femoralis (Testudinidae). Chelonian Conservation and Biology 11: 226-229. Loehr, V.J.T. 2012. Activity of the greater padloper (Homopus femoralis, Testudinidae), in relation to rainfall. African Zoology 47: 294-300. Loehr, V.J.T. 2013. Homopus femoralis (greater padloper). Reproduction. Herpetological Review 44: 304-305. Loehr, V.J.T. 2015. Small vernal home ranges in the Namaqualand speckled tortoise, Homopus signatus. Journal of Herpetology 49: 447-451. Loehr, V.J.T. 2016. Wide variation in carapacial scute patterns in a natural population of speckled tortoises, Homopus signatus. African Journal of Herpetology 65: 47-54. Loehr, V.J.T. 2017. Unexpected decline in a population of speckled tortoises. Journal of Wildlife Management 81: 470-476. Loehr, V.J.T. 2018. Thermoregulatory challenges in the habitat of the world's smallest tortoise, Chersobius signatus. Journal of Thermal Biology 71: 62-68. Loehr, V.J.T., Henen, B.T. and Hofmeyr, M.D. 2004. Reproduction of the smallest tortoise, the Namaqualand speckled padloper, Homopus signatus signatus. Herpetologica 60: 444-454. Loehr, V.J.T., Henen, B.T. and Hofmeyr, M.D. 2006. Shell characteristics and sexual dimorphism in the Namaqualand speckled padloper, Homopus signatus signatus. African Journal of Herpetology 55: 1-11. Loehr, V.J.T., Henen, B.T. and Hofmeyr, M.D. 2006. Tick infestations in the Namaqualand speckled padloper, Homopus signatus signatus (Gmelin, 1789). African Zoology 41: 170-177. Loehr, V.J.T., Hofmeyr, M.D. and Henen, B.T. 2007. Growing and shrinking in the smallest tortoise, Homopus signatus signatus: the importance of rain. Oecologia 153: 479-488. Loehr, V.J.T., Hofmeyr, M.D. and Henen, B.T. 2007. Annual variation in the body condition of a small, arid zone tortoise, Homopus signatus signatus. Journal of Arid Environments 71: 337-349. Loehr, V.J.T., Hofmeyr, M.D. and Henen, B.T. 2009. Small and sensitive to drought: consequences of aridification to the conservation of Homopus signatus signatus. African Journal of Herpetology 58: 116-125. Loehr, V.J.T., Henen, B.T. and Hofmeyr, M.D. 2011. Reproductive responses to rainfall in the Namaqualand speckled tortoise. Copeia 2011: 278-284. Loehr, V.J.T., Stark, T., Weterings, M. and Kuipers, H. 2015. Overcoming low environmental temperatures in the primary feeding season: low-level activity and long basking in the tortoise Homopus signatus. Amphibia-Reptilia 36: 207-214. Loehr, V.J.T., Voogdt, C.G.P. and Nolan, D. 2019. Ultrastructure of eggshells from wild and captive speckled dwarf tortoises, Chersobius signatus. Herpetologica 75: 63-68. Schleicher, A. and Loehr, V.J.T. 2001. Husbandry, behavior and captive breeding of the Nama padloper (Homopus bergeri) from southwestern Namibia. Chelonian Conservation and Biology 4: 165-170. Schmidt, F.A.C. 2003. Undersuchungen zur Stoffwechselphysiologie der beiden afrikanischen Landschildkröten Malacochersus tornieri und Homopus s. signatus in Abhängigkeit der Temperatur. Unpublished M.Sc. thesis. Frankfurt University, Germany. Loehr, V.J.T. (2014). The Namaqualand speckled padloper, Homopus signatus: smallest tortoise species in the world. Klerks, M. 2002. Adapting the Namaqualand speckled padloper, Homopus signatus signatus, to captive conditions. Turtle and Tortoise Newsletter 6: 30-32. Kooijman, M. 2010. Darmobstructie bij een Namaqualand gespikkelde padloper (Homopus signatus signatus) Gmelin, 1789. Trionyx 8: 138-145. Kooijman, M. 2013. ESF stamboek Homopus signatus. Trionyx 11: 88-91. Kuperus, S. and Loehr, V.J.T. 2009. Homopus femoralis Boulenger, 1888, Greater padloper. Nesting. African Herp News 49: 10-11. Licitra, J.T. 2001. Homopus s. signatus, Speckled Padloper. Observations on natural diet. African Herp News 32: 12-13. Licitra, J.T. 2001. Homopus s. signatus, Speckled padloper. Maximum size. African Herp News 32: 14-15. Loehr, V. 2013. Geautomatiseerd terrariumhouden met Siemens LOGO! Trionyx 11: 144-148. Loehr, V. 2015. Speckled tortoises (Homopus signatus) collected in the wild to reinforce the studbook. Http://www.homopus.org. Loehr, V. and Van Dijk, D. 1996. De Namaqualand gespikkelde padloper (Homopus s. signatus), waarnemingen in de natuur en verzorging in gevangenschap. De Schildpad 22(2): 42-51. Loehr, V.J.T. 1997. Homopus s. signatus, Namaqualand speckled padloper, captive breeding. African Herp News 26: 23-24. Published as a French translation in Tortuga 1999(2): 8-9. Loehr, V.J.T. 1999. Dietary requirements of captive hatchling Namaqualand speckled padlopers (Homopus s. signatus). African Herp News 28: 23-26. Loehr, V.J.T. 1999. Photoperiod, temperatures and breeding in captive Namaqualand speckled padlopers, Homopus s. signatus. African Herp News 28: 27-28. Loehr, V.J.T. 2000. Met het oog op bescherming: Onderzoek aan de Namaqualand gespikkelde padloper. De Schildpad 26: 75-80. Loehr, V.J.T. 2000. Stamboeken: Studbook Breeding Programme Homopus. In: Loehr, V., Torenstra, P. en Bruekers, J.. Special, ter gelegenheid van het 25-jarig bestaan van de Nederlandse Schildpadden Vereniging. Nederlandse Schildpadden Vereniging, Helmond. Loehr, V.J.T. 2001. Homopus s. signatus, Namaqualand speckled padloper. Female mating activity. African Herp News 32: 17-18. Loehr, V.J.T. 2001. Field report research on the Namaqualand speckled padloper (Homopus s. signatus) in South Africa. Tortoise Trust Newsletter Autumn 2000/Winter 2001: 3-4. Published as a Dutch translation in Lacerta 59: 182-187. Loehr, V.J.T. 2001. Field report H. s. signatus Spring 2001. Unpubl. report. Loehr, V.J.T. 2002. Male aggression in captive Namaqualand speckled padlopers (Homopus s. signatus). Bulletin of the Chicago Herpetological Society 37: 1. Loehr, V.J.T. 2003. Annual temperature fluctuation in the natural habitat of the Namaqualand speckled padloper, Homopus signatus signatus. Radiata 12: 25-27. Published simultaneously in German in Radiata. Loehr, V. 2003. Onderzoek aan de kleinste landschildpadsoort ter wereld - met uw steun. Trionyx 1: 127-130. Loehr, V.J.T. 2003. Field report H. s. signatus Spring 2003. Unpubl. report. Loehr, V. 2004. Is beschermen ook bedreigen? Trionyx 2(4): 98-102. Loehr, V.J.T. 2004. First recorded second generation breeding with the Namaqualand speckled padloper, Homopus signatus signatus. Radiata 13: 11-12. Loehr, V.J.T. 2004. A new thread-trailing method for small tortoises in densely structured habitats. Turtle and Tortoise Newsletter 2004(7): 13-14. Loehr, V.J.T. 2004. Homopus signatus signatus, Namaqualand Speckled Padloper. Aggressive Courtship Behaviour. African Herp News 37: 18-19. Loehr, V.J.T. 2004. Field report H. s. signatus Summer 2004. Unpubl. report. Loehr, V.J.T. 2005. Preliminary results of a long-term field study on the Namaqualand speckled padloper, Homopus signatus signatus. Emys 12: 4-17. Loehr, V.J.T. 2007. Een energiebesparende wijze van landschildpadden houden. Trionyx 5: 2-10. Loehr, V.J.T. 2008. Annual variation of the relative humidity in a rock crevice in the natural habitat of the Namaqualand speckled padloper, Homopus signatus signatus. Radiata 17: 30-32. Loehr, V.J.T. 2008. Homopus signatus signatus (Gmelin, 1789), Namaqualand speckled padloper. Natural oviposition and incubation. African Herp News 44: 9-10. Loehr, V.J.T. 2009. First captive breeding of the greater padloper, Homopus femoralis. Turtle and Tortoise Newsletter 13: 21-24. Loehr, V.J.T. 2009. The greater padloper (Homopus femoralis) in captivity: an assessment of husbandry feasibility. Radiata 18: 23-32. Loehr, V.J.T. and Harris-Smith, T.J. 1998. Homopus signatus, Speckled padloper, natural diet. African Herp News 28: 33-34. Loehr, V.J.T. 2012. Homopus femoralis Boulenger, 1888, greater padloper, diet. African Herp News 57: 9-10. Loehr, V.J.T. 2015. Twenty years of husbandry and breeding of the speckled tortoise (Homopus signatus) in a studbook: accomplishments and challenges for the future. The Batagur 5: 28-37. Loehr, V.J.T. 2017. Testudinidae, Homopus boulengeri, Duerden 1906, Karoo Padloper. Reproduction. African Herp News 65: 18-19. Loehr, V.J.T. 2018. Testudinidae, Chersobius boulengeri (Duerden, 1906), Karoo padloper. Reproduction. African Herp News 68: 37-39. Loehr, V.J.T. and Schmalz, M. 2001. Homopus signatus cafer, southern speckled padloper, autumn activity. African Herp News 32: 16. Reck, M. and Reck-Ringgenberg, S. 2013. Erfahrungen bei der Haltung und Fortpflanzung der Areolen-Flachschildkröte (Homopus areolatus) unter unterschiedlichen Bedingungen in Namibia und inder Schweiz. Marginata Juni-August 2013: 41-48. Saus, A. 2005. Beobachtungen zur Nahrungsaufnahme einer Nachzucht von Homopus signatus signatus in Relation zur Luftfeuchtigkeit. Schildkröten im Focus 2(1): 29-32. Schleicher, A. and Loehr, V.J.T. 2006. Husbandry, behaviour and captive breeding of the Nama padloper, Homopus sp. In: Artner, H., Farkas, B. and Loehr, V. (Eds.). Turtles. Proceedings: International Turtle & Tortoise Symposium Vienna 2002. Edition Chimaira, Frankfurt am Main, Germany. Pp. 459-466. Stark, T. 2013. Homopus signatus (Gmelin, 1789), speckled padloper, diet. African Herp News 59: 19-21. Stark, T. 2013. De insectenetende gespikkelde padloper (Homopus signatus) Gmelin, 1789. Trionyx 17: 56-58. Van Beest, A., Van den Brink, E. and Van Dam, P. 2014. De gespikkelde padloper (Homopus signatus Gmelin, 1789). Trionyx 12: 30-43. Van Loon, F. 2008. Kweken met Homopus signatus signatus. Terra 44: 3-7. Van Loon, F. 2010. "Groot padloper" in het terrarium (Homopus femoralis) Boulenger, 1888. Trionyx 8: 2-10. Alderton, D. 1988. Turtles and tortoises of the world. Blandford Press, London. Anonymous. Land tortoises of southern Africa; Cape Padloper (Homopus areolatus). African Wildlife. Undated. Anonymous. Land tortoises of southern Africa; Karoo Padloper (Homopus boulengeri). African Wildlife 40(2): 72. Undated. Anonymous. Land tortoises of southern Africa; Speckled Padloper (Homopus signatus). African Wildlife 40(6): 222. Undated. Archer, W.H. 1968. The padlopers. African Wild Life 22(1): 29-35. Baard, E.H.W. 1994. Cape tortoises, their identification and care. Cape Nature Conservation (South Africa). Barzyk, J.E. 1994. Husbandry and captive breeding of the parrot-beaked tortoise, Homopus areolatus. Chelonian Conservation and Biology 1: 138-141. Basile, I.A. 1989. Faszinierende Schildkröten - Landschildkröten. Verlag Stephanie Naglschmid, Stuttgart. Bayoff, N. 1995. Observations and morphometric data on the Namaqualand speckled tortoise, Homopus s. signatus (Gmelin, 1789), in South Africa. Chelonian Conservation and Biology 1: 215-220. Bonin, F., Deveaux, B. and Dupré, A. 1996. Toutes les tortues du monde. Delachaux et Niestlé, Lausanne (Switzerland). Boycott, R. 1986. A review of Homopus signatus with notes on related species. Journal of the Herpetological Association of Africa 32: 10-16. Boycott, R.C. and Bourquin, O. 1988. The South African tortoise book, a guide to South African tortoises, terrapins and turtles. Soutern Book Publishers, Johannesburg (South Africa). Boulenger, G.A. 1888. Description of a new land-tortoise from South Africa, from a specimen living in the society's gardens. Proceedings of the Zoological Society of London: 251 (1 plate). Boulenger, G.A. 1890. Note on the secondary sexual characters in the South-African tortoises of the genus Homopus. Proceedings of the Zoological Society of London: 521. Boulenger, G.A. 1902. A list of the fishes, batrachians and reptiles collected by M. J. ffolliott Darling in Mashonaland, with descriptions of new species. Proceedings of the Zoological Society of London May 1902: 13-17. Includes a plate of Homopus darlingi. Boulenger, G.A. 1907. Second report on the batrachians and reptiles collected in South Africa by Mr. C.H.B. Grant and presented to the British Museum by Mr. C.D. Rudd. Proceedings of the Zoological Society of London October 1907: 478-483. Bour, R.H. 1988. Taxonomic and nomeclatural status of Homopus signatus. Journal of the Herpetological Association of Africa 35: 1-6. Branch, W.R. and Braack, H.H. 1987. Reptiles and amphibians of the Karoo National Park: a surprising diversity. Journal of the Herpetological Association of Africa 36: 26-35. Branch, W.R. 1988&1998. Field Guide to the Snakes and Other Reptiles of Southern Africa. Three editions. Cape Town: Struik Publishers. Branch, W.R. 1988. Bill Branch se Veldgids tot die slange en ander reptiele van Suider-Afrika. Cape Town: Struik Publishers. Branch, W.R. 1989. Homopus bergeri, Species Status reports. In: Swingland, I.R. and Klemens, M.W.. The conservation biology of tortoises. Occasional Papers of the IUCN Species Survival Commission No. 5: 75-77. Branch, W.R. 1991. Homopus femoralis, greater padloper, size. Journal of the Herpetological Association of Africa: 39: 27. Branch, B.R. 1992. Homopus '' - a wrong name for a new tortoise from southern Namibia. Journal of the Herpetological Association of Africa 40: 11. Branch, W.R. 1993. South African Snakes and Other Reptiles, a photographic guide. London: New Holland Publishers. Branch, W.R. 1999. Homopus femoralis, greater padloper, egg and clutch size. African Herp News 30: 28-29. Branch, W.R. 2007. A new species of tortoise of the genus Homopus (Chelonia: Testudinidae) from southern Namibia. African Journal of Herpetological 56: 1-21. Broschell, S. 2000. Leben und Fortpflanzung der Areolen-Flachschildkröte Homopus areolatus (Thunberg, 1787) in menschlicher Obhut. Sauria 22(3): 3-9. Burger, M. 1993. The herpetofauna of Anysberg Nature Reserve, Cape Province, South Africa. Journal of the Herpetological Association of Africa 42: 1-12. Cairncross, B.L. 1946. Notes on South African Tortoises. Annals of the Transvaal Museum 1946: 395-397. Cunningham, P.L. and Simang, A. 2007. Some aspects of ecology and behaviour of Homopus sp. from southwestern Namibia (Testudines: Cryptodira: Testudinidae). Herpetozoa 19: 129-134. Daniels, S.R., Hofmeyr, M.D., Henen, B.T. and Baard, E.H.W. 2010. Systematics and phylogeography of a threatened tortoise, the speckled padloper. Animal Conservation 13: 237-246. Dampier, L. 1997. Cape Tortoises: The little guys of turtledom. Reptile Hobbyist October: 36-43. Deveaux, B. 1997. L'Afrique du Sud. La Tortue 16: 27. De Waal, S.W.P. 1980. The Testudines (Reptilia) of the Orange Free State, South Africa. Navorsinge van die Nasionale Museum 4: 85-91. Duerden, J.E. 1907. Genetics of the colour pattern in tortoises of the genus Homopus and its allies. Records of the Albany Museum 2 (1907): 65-92. Ernst, C. H. and Barbour, R.W. 1989. Turtles of the World. Washington D.C., London: Smithsonian Institution Press. Fleck, J. and Fleck, S. 2001. Erfolgreiche Nachzucht von Chersina angulata und Homopus areolatus über mehrere Jahre. Elaphe 9(3): 5-14. Goosen, H. 1983. Dopdiere uit die oertyd. Suid-Afrikaanse Panorama April 1983: 48-50. Gorseman, P. 1980. Opmerkingen over biotoop en voortplanting van Homopus areolatus. Lacerta 38: 107-111. Greig, J.C. 1987. Land tortoises of Southern Africa: Greater Padloper, Homopus femoralis. African Wildlife 41: 138. Greig, J.C. and Burdett, P.D. 1976. Patterns in the distribution of southern African terrestrial tortoises (Cryptodira: Testudinidae). Zoologica Africana 11: 249-273. Greig, J. and Boycott, R. 1978. Our land tortoises. African Wildlife 32: 39-42. Haagner, G.V. 1990. Homopus boulengeri, Karoo padloper, egg size. Journal of the Herpetological Association of Africa 37: 51. Hewitt, J. 1931. Descriptions of some African tortoises. Annals of the Natal Museum 6: 461-506. Hewitt, J. 1937. A note on the relationships of the Cape genera of land-tortoises. South African Journal of Science 33: 788-796. Hughes, B. 1986. Longevity records of African captive amphibians and reptiles: Part 1. Introduction and species list 1 - amphibians and chelonians. Journal of the Herpetological Association of Africa 32: 1-9. Iverson, J.B. 1992. A Revised Checklist with Distribution Maps of the Turtles of the World. Privately printed. IUCN/SSC Tortoise and Freshwater Turtle Specialist Group (1989). Tortoises and Freshwater Turtles; An Action Plan for their Conservation. IUCN, Gland, Switzerland. Karl, H.-V. and Tichy, G. 1999. Die Taxonomie von Homopus bergeri LINDHOLM 1906 (Testudines: Testudinidae). Mauritania 17(2): 277-284. King, F.W. and Burke, R.L. 1989. Crocodilian, Tuatara, and Turtle species of the world. A taxonomic and geographic reference. Association of Systematics Collections, Washington, DC. Loveridge, A., Willams, E.E. 1957. Genus Homopus Duméril and Bibron. In: Revision of the African tortoises and turtles of the suborder Cryptodira. Bulletin of the Museum of Comparative Zoology 115: 352-374. Mertens, R. 1955. Die Amphibien und Reptilien Südwestafrikas: aus den Ergebnissen einer im Jahre 1952 ausgeführten Reise. Abhandlungen der Senckenbergischen Naturforschenden Gesellschaft 490: 33-39. Morgan, D.R. 1993. Homopus signatus, speckled padloper, reproduction. Jourbal of the Herpetological Association of Africa 42: 34. Müller, G. 1987. Schildkröten: Land-, Sumpf- und Wasserschildkröten im Terrarium. Unknown publisher. Müller, V. and Schmidt, W. 1995. Landschildkröten. Natur und Tier - Verlag, Münster (Germany). Noel-Hume, I. and Noel-Hulme, A. 1954. Tortoises, terrapins and turtles. W. & G. Foyle, Ltd. London. Obst, F.J. 1980. Schildkröten. Urania Verlag, Leipzig - Jena - Berlin. Obst, F.J. 1988. Die Welt der Schildkröten. Leipzig (Edition Leipzig). Oettle, E.E., Steytler, Y.G.M., and Williams M.C. 1990: High mortality in a tortoise colony. South African Journal of Wildlife Research 20: 21-25. Palmer, M. 1994. The speckled tortoise, Homopus signatus, in captivity. Tortuga Gazette 30: 1-5. Patterson, R. 1991. Snakes and other reptiles of southern Africa. Cape Town: Struik Publishers. Perrin, M.R. and Campbell, B.S. 1981. Some aspects of thermoregulation in three species of southern African tortoises. South African Journal of Zoology 16: 35-43. Pritchard, P.C.H. 1967. Living turtles of the world. T.F.H. Publications, Jersey City NJ. Pritchard, P.C.H. 1979. Encyclopedia of turtles. T.F.H. Publications, Neptune NJ. Rogner, M. 1996. Schildkröten 2. Heidi-Rogner-Verlag, Hürtgenwald. Rose, W. 1950. The reptiles and amphibians of southern Africa. Maskew Miller, Ltd., Cape Town. Rust, H.T. 1937. Interessante Schildkröten IV Die Gattung Homopus. Wochenschrift für Aquarium und Terrariumkunde 34: 699-700. Schleicher, A. 2000. Ein Leben in Afrika für die Schildkröten; Alfred Schleicher - Windhoek, Namibia. Schildkröte 2 (2): 60-65. Schleicher, A. 2004. Experiences with keeping and breeding the Namibian Cape Tortoise Homopus sp. ("Homopus bergeri"), in a Namibian outdoor enclosure. Radiata (English Edition) 13: 3-12. Schmidt, F. and Engelbrecht, K. 2006. Homopus signatus. Maximum male size. Herpetological Review 37: 216. Siebenrock, K.F. 1909. Homopus bergeri Ldh., eine Testudo-Art aus der Geometrica-Gruppe. Zoologischer Anzeiger 34: 623-625. Swingland, I.R., Klemens, M.W., IUCN/SSC Tortoise and Freshwater Turtle Specialist Group, The Durell Institute of Conservation and Ecology (1989). The Conservation Biology of Tortoises; Occasional Papers of the IUCN Species Survival Commission no. 5. IUCN, Gland, Switzerland. Van Wyk, J.C.P. and Bates, M.F. 1999. Homopus boulengeri Duerden, 1906, Karroo padloper. African Herp News 28: 42-43. Vetter, H. 2002. Terralog Turtles of the World. Vol. 1./Schilkröten der Welt. Band 1. Edition Chimaira, Frankfurt. Windolf, R. 1984. Schildkröten stellen sich vor: No.21: Die Gattung Homopus (Flachschildkröten). Die Schildkröte 6: 52-60.